In 1861, with very few resources, the Confederacy attempted to arm itself. Several armories and factories were created in the South to help meet these needs. 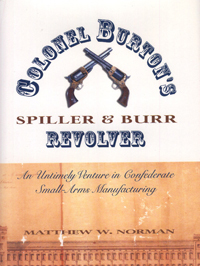 Colonel Burton's Spiller & Burr Revolver is based exclusively on primary sources, and provides a detailed history about one of those manufacturing firms during the Civil War. The book describes how the factory's history applies to Southern industrialism in the mid-nineteenth century. Revolving around the creation, operation, and demise of a pistol factory, this book illustrates the struggles of the factory and thus the Confederacy during the Civil War. Created at the suggestion of the Confederate government, the factory rose in Richmond, Virginia, from the conglomeration of two wealthy Virginia gentlemen, Edward N. Spiller and David J. Burr; one small arms expert, James H. Burton; and high hopes and dreams. Shortly after getting started, the factory that created the pistol known as the Spiller & Burr moved from the Confederate capital to Atlanta, Georgia. In Atlanta, the company encountered difficulty producing the revolvers in quantity due to a shortage of labor and problems raw materials. Before General Sherman arrived in Atlanta, the factory was sold to the Confederate government and moved to the Confederate States Armory in Macon, Georgia, but Sherman's march through Georgia imposed even more problems. The factory ceased production at war's end with slightly more than 1,500 revolvers fabricated, fulfilling only one tenth the number called for in the original contract. This factory tried to overcome the South's industrial deficiencies, and almost succeeded. To survive, a factory needs workers, materials, machines, and money. The factory had some difficulties in procuring the necessary materials, but mainly suffered from the threat of invasion and the lack of an adequate workforce. It had many of the ingredients necessary for success but suffered from the untimely misfortunes of war. Ironically, the war provided both the impetus for its creation, yet eventually led to its demise. But Southern factories created during the Civil War, like this one, had an impact. The South was affected by this new industrialism, both during and after the war.